Most children enrolled in Medicaid receive services through a Medicaid health plan, such as an HMO or other insurance company. The state Medicaid agency and the Medicaid health plan determine if treatments are medically necessary and which providers can be reimbursed for services. Under the Early and Periodic Screening, Diagnostic, and Treatment (EPSDT) benefit of Medicaid, beneficiaries under the age of 21 are entitled to all health care services that are found to be medically necessary to treat conditions discovered in a child. Medicaid is most often determined by income, but eligibility varies by state. Visit the Medicaid website or contact your state’s Medicaid program for an overview of each state’s Medicaid program, including income and other eligibility requirements. Please note that Achieving a Better Life Experience (ABLE) Accounts do not affect Medicaid eligibility. Some states disregard income for individuals with disabilities (including autism) who require an institutional level of care. The child is 18 years old or younger. The child meets the state’s definition of “institutional level of care”. The child has medical needs that can be safely provided outside of an institutional setting. The cost of care in the community does not exceed the cost of institutional care. Refer to the Center for Advancing Health Policy and Practice for states that offer Katie Beckett State Plan Options or similar “TEFRA look-alike" programs. If your family earns too much to qualify for Medicaid, the Children’s Health Insurance Program may be able to provide publicly funded health coverage. Our EPSDT Toolkit helps families who are working to secure Medicaid payment for medically necessary treatments for autism, including Applied Behavior Analysis (ABA). Download this free resource and share it with your behavior analyst and other autism service providers. If your child is enrolled in Medicaid and has been denied medically necessary treatments, email us at advocacy@autismspeaks.org to learn about your rights and how to access the EPSDT benefit. Autism Speaks continues to work to improve access to healthcare for children with autism enrolled in Medicaid and CHIP. We advocate at the state and federal levels to increase access and preserve the integrity of these publicly-funded healthcare programs which cover more than 50% of all children in the US. The EPSDT program has been around for decades. However, the federal government only recently clarified to state Medicaid agencies that all medically necessary services for autism must be included. This requirement is regardless of whether the service is covered in a state's Medicaid plan. 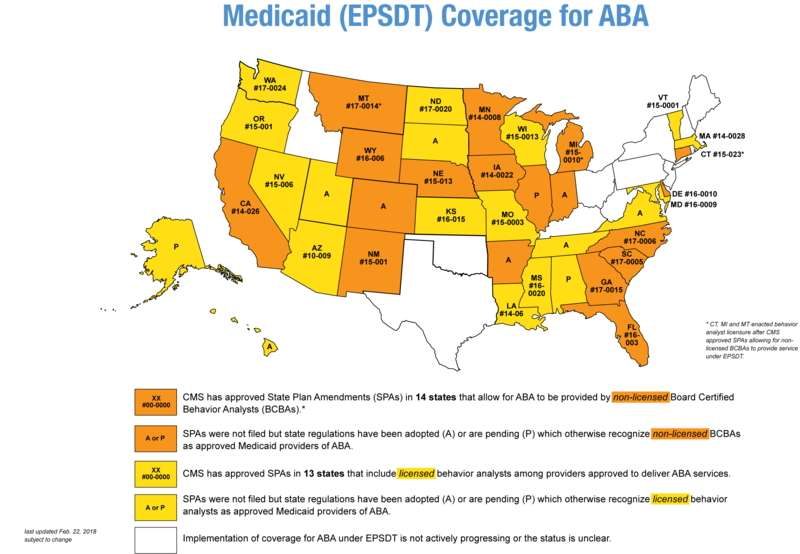 Since 2014, most state Medicaid agencies have amended their state plans or adopted state regulations that clarify ABA as a covered benefit when medically necessary and provided by qualified Medicaid providers.